Geodesic Domes- Meet the Goliath of the backpacking domes! And, what's become of the famous climbing Whittaker Brothers. The material below is derived from a visit I made to the hometown of the Rainier Mountain Guides (RMI) in Ashford, WA near Mt. Rainier, and correspondence with tent designer Martin Zemitis. Ashford, Washington, just outside the park boundary of Mt. Rainier National Park...State Highway 706. I'd glimpsed this monster dome tent in video footage of a Mt. Everest climb, but had never imagined it turning up in my very backyard! But there it was beside the highway in Ashford, Washington (click for more detail on this tent)... It was set up on a lawn next to an outdoor climbing wall at the Whittaker Mountainering Store. Yes, your guess is correct, I am referring to THE Whittaker's of climbing fame, Jim and Lou Whittaker. Remember, the first American expedition to conqueor Mt. Everest, back in 1963? That's when "Big Jim" Whittaker became the very first American climber to summit the mountain! Click to see more on this topic! Both of the twin Whittaker brothers, Lou and Jim, began guiding on "The Mountain," Mt. Rainier, in 1948. After a long series of turns and twists, including both young men being drafted for the Korean War, they wound up back on Mt.Rainier doing what they loved-- guiding climbs....Click here to see my Mt. Rainier page. Jim was pulled more and more into retail sales, culminating in a long career with REI that began in 1955 when Lloyd Anderson, the founder of REI, asked Jim to run REI's first retail store. Jim left REI in 1979. Meanwhile, in the early 1960s, Lou got connected with pioneer gearmaker Gerry Cunningham in Colorado, and became Gerry's Northwest dealer, based in his store in Tacoma, Washington. Click here to visit my two pages about GERRY! (note: info. focused on GERRY and climbing and the Whittaker brothers will be found on page 2). In 1968, Lou was offered the official guiding concession for Mt. Rainier in 1968. Operating out of a base in nearby Ashford, he was very busy for many years as the sole guiding service on the Mountain..He was involved for some time also with JanSport, appearing in some of the late Seventies JanSport catalogs (click link)...... 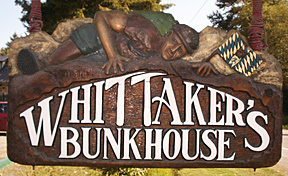 In recent years, Lou's son Peter and his wife Erika have been handed the reins to the business, which includes the $1.2 million/year sales of the store, plus the Guide service, plus a restaurant, extensive gear rental service, and excellent lodging facilities at Whittaker's Bunkhouse... I have stayed there, and can attest to its quaint charm and reasonable prices, especially in the off-season. Please Note: All Material above, and in all my "History of Gear" webpages, is copyrighted, and no usage of my material is permitted unless explicit permission is granted by me, Bruce B. Johnson, owner of OregonPhotos.com. Editors: Please contact me (brucej@oregonphotos.com) if you have interest in publishing....Others: if you were involved with one of the old-line, vintage gear companies and have a story to tell in these pages, please contact me soon. Main Page: Essays and pictures about the Pioneers of the Outdoor Gear Revolution, 1935-The Present, 45+ pages, six books written, and still-expanding! My Ashford image captures the Mountain Hardwear "Space Station" or "Stronghold" tent, which is 6 meters in diameter. To see this mighty tent in action, take a look at pages 112 and 118 in National Geographic Magazine, January 2008 edition, where you will see the Space Station being used on a winter assault of Nanga Parbat in the Karakoram. Recently, I also noted this tent being used as a "Warming Hut" at the 2007 Winter Outdoor Retailers Meeting in Salt Lake City (the OIA)-- it was part of their Backcountry Base Camp, outside in the snow.......HISTORY of the Tent-- Martin Zemitis told me, "The impetus for creating such a large geodesic dome tent came directly from expeditionary folks circa 1994. They wanted something both huge and extremely stormproof. A further parameter was that it could not be so big and bulky that it could not be fit onto the back of one Yak. Thus the final tent came in at 6 meters in diameter." I did not measure the tent in Ashford, but I would imagine its inside peak height to be 9 or 10 feet. Further detail is contained below, some of it might give you a chuckle! A bit of History of the company Mountain Hardwear-- it was formed by Jack Gilbert in 1993. Mr. Gilbert had just come out of being President of Sierra Designs, and before that was prominent at The North Face for twenty years. Martin Zemitis, designer of the Mountain Hardwear Space Station tent offers this history below....(added 2/14/2007). Update Note, January 2016: Mr. Zemitis is now the proud leader of a tent company of his own. It's named "Slingfin," and its innovative tents are gaining wide acclaim, especially among serious mountaineers. my later years of tent design." "Wind the clock forward.... 1994." to Robert. Then Ed wanted one. Then the marketing department wanted one. agreed to add it to the tent line." "wow, yours is bigger than ours". It was the reaction we were hoping for." 10 Meter Dome but we have no plans on adding it to the line anytime soon. something we are interested in making." 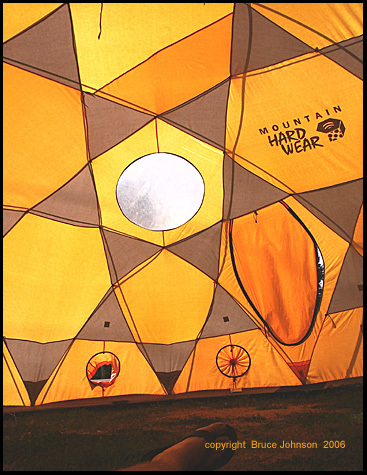 ( who was with Mountain Hardwear in 2007)--- click to see another well-known geodesic tent that Martin designed and named! * Ed Viesturs is unquestionably one of the World's top expeditionary mountaineers, probably second only to Reinold Messner. While Messner (a German) was the World's first person to successfully climb all fourteen of the World's 8,000 meter peaks, Viesturs was right behind with his "Endeavor 8000." On May 12, 2005, he achieved his final summit, Annapurna. It had taken him 16 years to complete all fourteen 8000 meter peaks. Thus, he became both the first American to achieve this mark, and also summited all of the peaks without supplementary oxygen, a deed that only five other climbers have done... In addition, Viesturs has other mountaineering credits, eg. he's ascended Mt. Everest six different times, including being one of the stars of the IMAX movie that filmed on the summit of Everest.